You have inflation and you have investments. You want your investments to beat inflation. 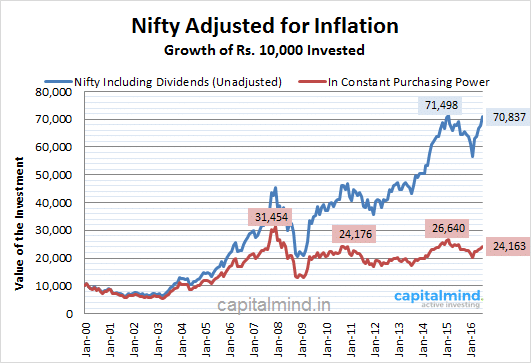 We have a special thing at Capital Mind which we do once in a while – the Nifty , adjusted for inflation. the CPI Index to give you an idea of purchasing power of the Nifty. If you had invested Rs. 10,000 in 2000, then that money would have grown to a whopping 70,837 now! But if you adjust for the purchasing power drop through inflation, we are not even at the levels we saw in 2007. And that’s how inflation eats into your returns. High inflation periods make your investments look good, but your “real” returns are zero.